GoodParentGoodChild books, give parents successful techniques to solve specific parenting challenges. They are written from the perspectives of a pediatric psychologist, a clinical social worker, and the mother of both a toddler and a 'tween. The GoodParentGoodChild series presents actual case stories, making the books more interesting and real. The series also features companion story books for your children, Matilda and Maxwell. These beautiful and very funny books will help and delight your children, and make you laugh. ABOUT GOODNIGHT: Good Night introduces you to a simple, thoughtful, and effective technique called "What's the Rule." The authors have taught parents this technique for over 35 years, and now present it in a clear and often humorous light in Good Night. Parents can expect great changes in nighttime behavior. What's even more interesting is that with better bedtime behavior, a recent study shows children's overall behavior improves. ABOUT THE AUTHORS: Stephanie Donaldson-Pressman, LICSW is the author of the best selling Narcissistic Family: Diagnosis and Treatment. She has been working with adults, children and families for over 20 years. Dr. Robert Pressman is a pediatric psychologist with over 35 years of experience. He is certified by the American Board of Professional Psychology and is the author of five texts. Rebecca Jackson is the founder and CEO of Good Parent, Inc. She is the working mother of both a toddler and a 'tween. REVIEWS: "This book is a small miracle. 'What's the Rule?' is extremely sensible, the technique is explained very clearly, and the parent stories are terrific." --Dr. Laurence E. Bouchard, Family Physician and Past President, American Osteopathic Association. "Good Night is as helpful as it is entertaining. 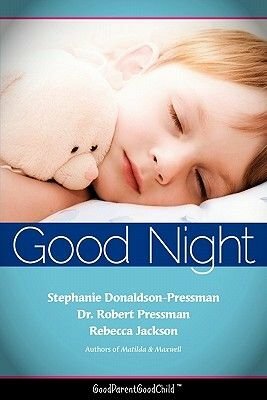 After decades of treating children and training doctors, I believe that Good Night offers the clearest and most practical system for changing children's behavior." -- Joel K. Weltman, MD, PhD, Pediatric Allergist, Clinical Professor Emeritus, Brown University Medical School. "This beautifully written book is the answer for so many parents who struggle with getting their children to bed." --Dr. Jack G. Wiggins, Past President, American Psychological Association "After using What's the Rule? for only three nights, for the first time ever, our kids slept peacefully in their own beds all night." Amy Byron, mother of three.